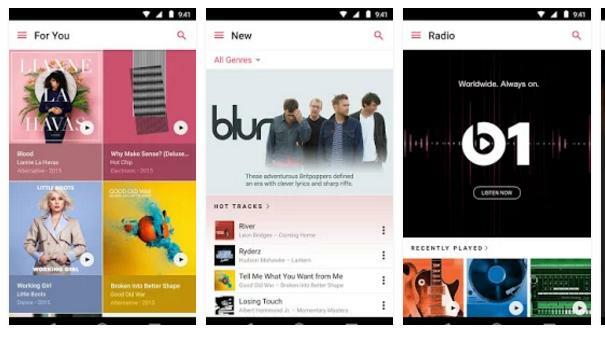 The Apple music service was launched to give Android users an opportunity to enjoy high-quality music on their mobile devices. The service is free for the 1st three months after which you’ll have to become a premium subscriber. Paid subscription costs around 1.9 USD i.e. 120 INR. Apple Music has a large collection of songs from artists all over the world. It is among the best Android apps developed by the iPhone manufacturer. To use this app and access its library, you must have an Apple ID. If you don’t have the ID, Apple music has an option to create one. Once you log into this application, you’ll be recommended some nice songs which have been shortlisted by folks that are considered to be music experts by Apple INC.
From the recommendations, you can play the song which you like. Apple Music allows you to access its well-organized collection of folk, classic, rock, hip hop, R & B songs. If you’re confused to play a song, you can switch to the inbuilt radio module where the popular, trending and best songs will be played back to back. The app has a connect feature with which you can get more details on the songs the artist has published. It allows you to create and manage your playlist. If you’re using this app on your Android phone, you’ll be aware that widget support has been added to it. With this feature, the user can add music controls to the home screen of their phone. If you do so, you don’t have to open the app each time for listening to your favorite song. In the widget, the user will find options to change, pause or play the tracks. There’s a heart button which functions an upvote for the song. Apple music is still in beta stage, but it’s a good alternative to SoundCloud. spotify, Wynk, Saavn and other similar services. In the next update, you’ll be able to enjoy music videos along with songs. This will make it a good alternative to YouTube. Apple music is a free application which can be downloaded from the Google Play Store.